toneybatter, historically known as Bohernaglogh , is a neighbourhood of Dublin, on the Northside of the city between the River Liffey, the North Circular Road, Smithfield Market, and Grangegorman. It is in the Dublin 7 postal district. Apart from the striking artisan dwellings, the area is also known for the prominent Viking street names. For example, there is Viking Road, Olaf Road, Thor Place, Sitric Road, Norseman Place, Ard Ri Road, Malachi Road, Ostman Place, Sigurd Road and Harold Road. At the time of the Norman invasion, the Vikings, Ostmen or Austmenn (men of the East) as they called themselves, were exiled to the north of the Liffey where they founded the hamlet of Ostmenstown later to become Oxmantown. 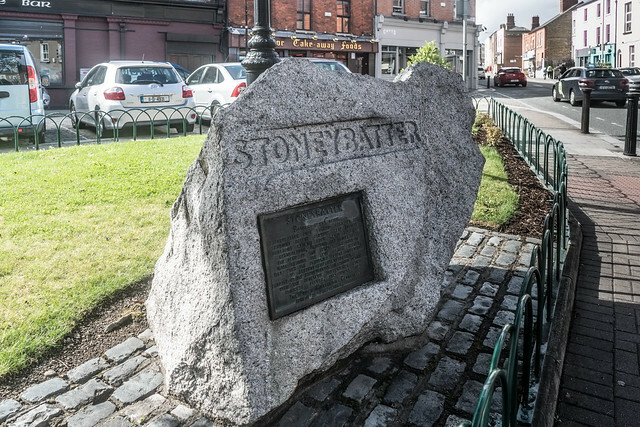 The northern end of Stoneybatter derives its name of Manor Street, bestowed in 1780, from the Manor of Grangegorman in which it was located. The Manor itself was later transformed into a police barracks. During the reign of Charles II (1660-1680), the Manor was held by Sir Thomas Stanley, a knight of Henry Cromwell and a staunch supporter of the Restoration. The short thoroughfare in Stoneybatter called Stanley Street is named after him.